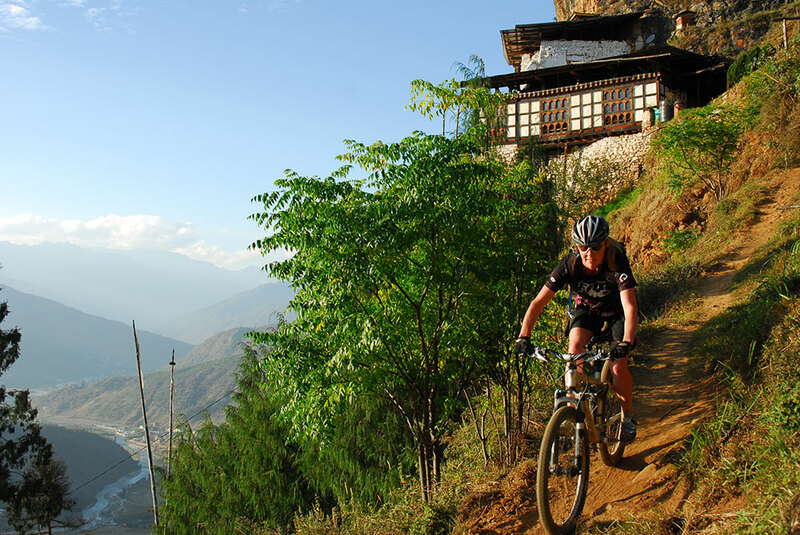 An amazing 13-day Bhutan Mountain biking tour with our expert tour leaders. You won’t miss the sightseeing of all the major sights either. tour across Bhutan with our expert tour leaders. You won’t miss the sightseeing of all the major sights either. 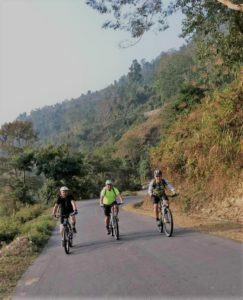 Our cycling with sightseeing of the major sights of Western and Central Bhutan. Follow the West-East highway from Paro to Bumthang cycling between three to five hours a day and driving during the less interesting sections. You will be fully-supported with vehicles so that at any time individuals can take a break and follow the group in the bus. In Bhutan, most of the cycling is on the small and bumpy main road but there will be some off-road cycling on farm tracks. This is a challenging tour for fit and experienced mountain-biking enthusiasts. It will give you a unique experience and many fond memories of your amazing adventure. Day 1 ARRIVAL IN BHUTAN. BIKE FITTING AND TRIAL RUN (2,300m). Arrive Paro. Transfer to hotel and relax before lunch. Spend the afternoon fitting your bikes and, if time permits, set out on a trial run. Dinner at the hotel and a trip briefing by your tour leader. Day 2 CYCLE TO PUNAKHA (Altitudes ranging between 1,200m and 3,000m). Set out for Punakha. Travel the first 50kms on the best road in Bhutan before starting the uphill ascent towards the Dochula Pass. A 17km climb brings you to the 3000m Dochula Pass where we will stop for a view of the distant Himalayas and lunch. The descent to Lobesa is mainly though pine, oak and rhododendron forests and lasts for 38 kms. The final 8km stretch into Punakha, passes gently terraced rice-fields and skirts a large river. You are now at an altitude of 1,200m. Sights you will visit: Chimi Lhakhang and Punakha Dzong. Total distance: 100km. Duration: 7 hours. Day 3 CYCLE TO THE PHOBJIKHA VALLEY (Altitudes between 1,200m and 2,800m). Set our from Punakha for another uphill cycle towards Gangtey, situated in the Phobjikha valley at an altitude of 2,900m. Today’s trip will take approximately 5 – 6 hours and you will cover a total of 75kms, the majority of it uphill. Your support vehicle will be with you at all times and your leader will advise you on your pace and the best sections to cover by bus. Once you have crossed the Lawala Pass into Gangtey at 3,200m. the cycling is all downhill through dwarf bamboo past a few yaks and into the beautiful glacial valley. Total distance: 75km (uphill 55km). Duration: 5 – 6 hours. Day 4 CYCLE EVER-WINDING ROADS TO TRONGSA (Altitudes between 2,500m and 3,300m). Visit some of the sights of the Phobjikha valley, including Gangtey Monastery and the Black-necked Crane center before setting out on your bicycle uphill for the first 10km towards the pass and then downhill for approximately 18km towards your lunch stop and a visit to the Chendibji stupa. In the afternoon, a gradual, winding ride brings you all the way to Trongsa along roads that cut through the steep-sided Black Mountains. Day 5 CYCLE TO THE BUMTHANG VALLEY (Altitudes between 2,500m and 3,400m). Visit the Trongsa Museum before setting out towards the Yotong-La pass. Start by driving for about an hour and then challenge yourself to reach the highest pass on the tour at 3,400m. The pass may well be covered in mist. This is a difficult, long uphill climb for about 7 – 8 km but we will adjust the cycling time to your fitness level and at all times you have access to the bus. A 12km downhill ride takes you all the way to Chummey for lunch. Pass an afternoon of gentle cycling, mainly downhill, with a few stops here and there to see local women weavers and scenes of rural life. There is just one mini-pass of 2,900m known as Kiki-la. Then its all the way down to Jakar Village in the Bumthang plateau (2,700m). Day 6 REST DAY IN JAKAR, BUMTHANG. A gentle day of sightseeing by bicycle in and around Jakar. Visit Kurjey Lhakhang, Jambay Lhakhang and Tamshing Lhakhang, the three most important temples in this place of Buddhist pilgrimage. 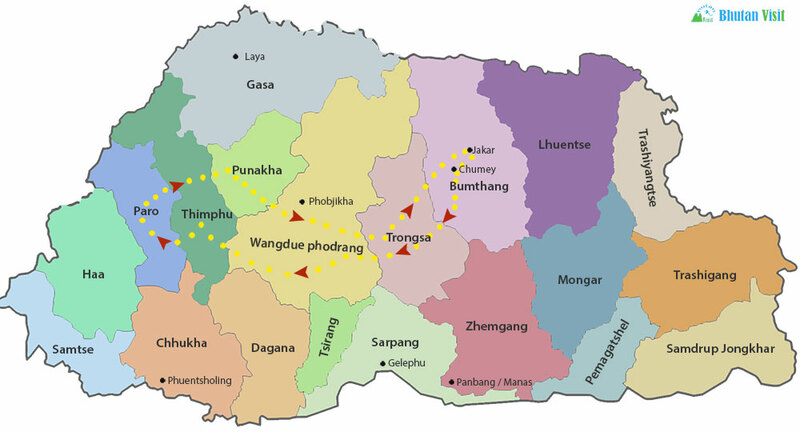 Try out some of the Bumthang delicacies such as the honey, cheese and fresh beer. Relax in the fresh and beautiful plateau of Bumthang. Maybe take a hot-stone bath or stroll around the tiny Jakar town. Day 7 EXCURSION CYCLING TO THE TANG VALLEY (Altitudes between 2,700m & 2,800m). Start out early on a 36km ride to Tang Ogyen Choling village and farmhouse. The trail follows a rough farm-road for almost the whole way and it will take 3 – 4 hours to reach the village and the newly-built traditional-style farmhouse where you will stay the night. After a typical Bumthang lunch, spend the afternoon learning how to make some traditional Bhutanese dishes and even learn how to distill Bhutanese “ara”. Spend the evening relaxing deep in the Bhutanese countryside. Day 8 RETURN CYCLE OR DRIVE TO JAKAR (Altitudes between 2,800m and 2,900m). Today you have the choice to cycle or sit in the bus, travelling back the way you came yesterday. We hope that we can get the chance to stop at a small local school but it depends on the school schedule. Lunch back in Jakar. In the afternoon, cycle 9km uphill towards Kiki-La pass and continue on a gentle incline to Chumey village and an overnight stay at Chumey Nature Resort. Day 9 CYCLE TO WANGDI (Altitudes between 1,200m and 3,400m). Start at around 06:30 today and drive to Chendibji Chorten, via Trongsa. This journey will take about 4 hours. From here challenge yourselves to a 19km uphill cycle for about 2 hours until you reach the lunch stop just below the Pele-La pass. After lunch cycle the final 8km up to the pass. From here there is a 50km downhill stretch all the way to Wangdi where we will stop for the night. Day 10 CYCLE TO THIMPHU (Altitudes between 1,200m and 3,000m). Today will see you recross the Dochula Pass after a 10km downhill cycle followed by a 28km uphill climb. The lunch stop will be at Menchuna, half way up the hill towards the pass. A 16km cycle brings you to the pass just in time for a nice tea break with great views of the Himalayan peaks. A 21km downhill ride brings you back to Thimphu, the capital city. Day 11 SIGHTSEEING AND RELAXING IN THIMPHU (2,400m). Leave the bikes behind for a day of sightseeing in Thimphu. Visit the Buddha point, the Folk Heritage Museum, the Institute for the 13 Traditional Arts (Zorig Chusum), the Textile Museum, and the impressive Thimphu Dzong. Day 12 DRIVE TO PARO (2,300m). Start early and drive to Paro (1 hr). Hike to Taktsang monastery (the “Tiger’s Nest”). The round-trip (hike or horse ride) takes about 4 hours and includes a visit to the monastery. Spend the afternoon relaxing and browsing in Paro town. Flight departure from Paro. We hope you have enjoyed this cycling adventure in Bhutan. Tashi Delek! 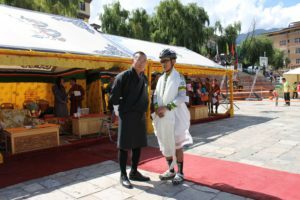 Ugyen is the only person to have participated all 6 times in the notorious 265km Tour of the Dragon Cycle Race that has been taking place every September since 2010. The race starts in Bumthang at 2am and the first cyclists reach Thimphu towards 11am, having crossed several passes that soar above 3,000 metres. In 2010 Ugyen came first and in 2012 and 13 he was in second position. 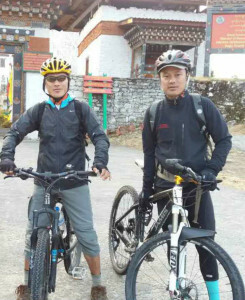 Ugyen has been cycling since 1998 when the sport was just starting up in Bhutan. He has biked across the whole country twice and he also had the chance to cycle on the world’s highest motorable road in 2009, reaching a height of 5,602 meters. Ugyen also underwent a 5-month training in the US in bike mechanics. Rinzin also started cycling in 1998, being among a small group of cycling adventurers.He came in 2nd position in the Tour of the Dragon race in 2010 and 2012. He has learned many of his cycling and bike mechanic skills from Ugyen and he will be the main person responsible for keeping your bikes in tip-top shape during this tour. The Cost Includes Accommodation in 3* tourist hotels (Hotel upgrades available on request). 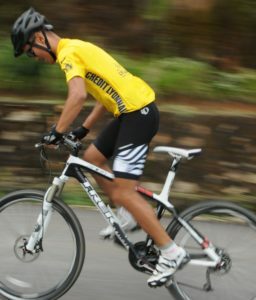 Experienced English-speaking cycling tour leader / licensed guide.